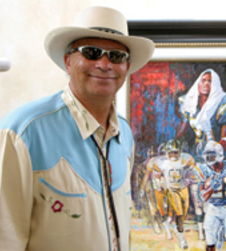 In a wide-ranging conversation, Gene Locklear and Richard Muscio discuss the plight of Native Americans, baseball and how hitting has changed, and his art and how it has transformed over the years. Gene Locklear is a full-blooded member of the Lumbee Indian Nation. Playing baseball and creating art has been his passions since he was a child. As a 6-year-old in art class, he knew he wanted to be an artist and continued to paint throughout his baseball career. Known as “Chief”, Gene played 10 years in the major leagues for the Cincinnati Reds, San Diego Padres, and the New York Yankees. Gene takes pride in having helped to break down racial barriers by becoming the first member of the Lumbee tribe to play professional sports and being one of only about two dozen Native Americans to play in the majors. After fighting for playing time and dealing with prejudices, he quit baseball and concentrated on art. He maintains countless friendships with fellow major leaguers and professional athletes from throughout the sports world by virtue of the sports-themed artwork he has created. He continues to produce works of art in oils, acrylics, and pencil. You can see his excellent his works of art at www.genelocklear.com.